Welcome to Follow the Money’s Weekly Metals Report for the week of August 14! Gold, silver, and the mining stocks remained within their post-Brexit trading ranges this week. The growing belief that the Fed has no intention of raising rates anytime soon, combined with the global trend towards negative interest rates and turmoil with European banks, etc., has put a $1308/$19.25 floor under the metals since the last week of June. Gold bears point to the Atlanta Fed’s GDPNow, which is projecting a 3.5% GDP growth rate for 3Q 2016 as well as the supposed half million jobs created over the past two months. If a flurry of massaged economic indicators were to come in that continue to support this forecast, the dollar could remain strong, pressuring the metals short-term. Gold rallied on a poor GDP number a couple of weeks back, so it stands to reason that the metals would be tempered by a good GDP print. There’s precedent for especially rosy economic numbers to be put out leading up to an election, only to be revised back downward after the establishment favorite has secured the office. Positive economic data benefits Clinton and acts as a headwind for Trump. As a trader/investor, it is wise to remain cognizant of the incentive to “massage” the data. That said, Friday saw the release of dismal retail sales, consumer confidence, and productivity numbers. Underneath the veneer of a 4.9% unemployment rate, a 3.5% 3Q GDP projection, and the soothing sounds uttered by politicians, lies dense structural rot that will assert itself in the fullness of time. What matters to traders and investors in the short-term, however, is the market’s perception, not necessarily the reality. 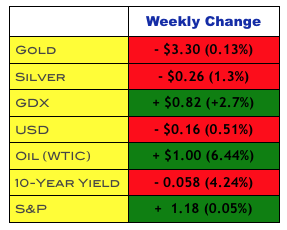 For the week, gold and silver were down $3.30 and $0.26 respectively, with most of the losses coming after Friday’s failed rally. The USD was down 0.5% on the week, closing at $95.68. Oil rallied 6.4%. 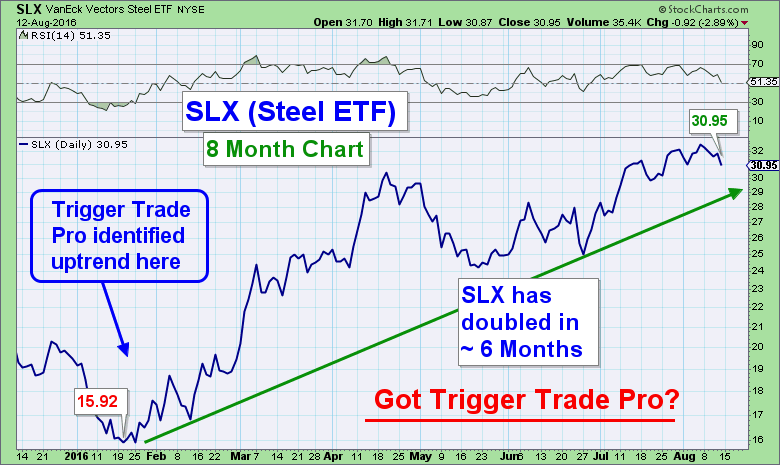 The metals tend to like a rising oil price. Bond yields fell this week, with the 10-yr Treasury currently yielding 1.54%. The S&P was mostly flat, rising 1.18 to 2184. Below is a brief synopsis of several stories that highlight and expand upon some of the trends being tracked at Follow the Money. Foreigners Dump U.S. Debt. “Treasury sales by official investors reflect the big fall in Chinese reserves, and the ongoing need by some oil exporters to sell assets, such as Saudi Arabia,” according to Brad Setser, a senior fellow at the Council on Foreign Relations. 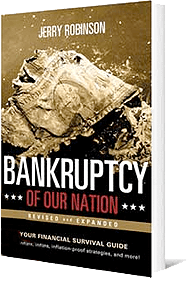 Total U.S. government debt is approaching $20 trillion, not including the ~$100 Trillion in unfunded liabilities. A primary reason the debt pyramid has not yet imploded is because foreign investors -and the Fed- have been aggressive buyers of U.S. Treasuries, keeping interest rates suppressed. What will happen when foreign buyers turn into sellers? Yikes. The latest data shows that China, Saudi Arabia, and others are selling U.S. debt. This is a trend worth monitoring, and we’ll be paying close attention. The concept of “Helicopter Money” [Debt Monetization] is being floated again this week. Central planners often leak economic policy plans to media outlets in order to ease the public into accepting otherwise ludicrous actions. QE and “Helicopter Money” both involve money printing by central banks, but with QE, the Fed buys bonds from banks and pays for the bonds with printed money. With “Helicopter Money,” the Fed would buy debt directly from the Treasury to finance more government spending. When enacted, it will likely be deceptively dubbed “QE for the People!,” or something to that effect. Gee, that sounds great!…kinda like the “Affordable Care Act,” “USA Freedom Act,” “Patriot Act,” or any host of other policies “for the people,” but I digress. Former Acting CIA Director Morell: ‘We Need to Kill Russians and Iranians’ This week, former CIA Director Morell went on national television advocating the escalation of hostilities with a nuclear superpower (Russia) and Iran. So much for cool heads, diplomacy, and the use of force as a last resort. War often translates to profit for the well connected, especially when it involves an enemy that is not particularly fond of the Petrodollar System. Project this trend of “Fire, Ready, Aim! !” foreign policy into the next decade (or sooner) and the results are predictable. What 28 Pages? The State Department has approved a $1.15 billion arms sale to our “friends” in Saudi Arabia. If approved by the Senate, the sale will support the kingdom’s war on its southern border in Yemen, home to a humanitarian crisis with 20 million people lacking access to clean water. General Dynamics — the principal contractor on this deal — stands to profit handsomely. We Follow the Money, not popular opinion. The U.S. Defense Security Agency said, “This sale…conveys U.S. commitment to defending the Petrodallar System Saudi Arabia’s security and armed forces modernization.” Let’s take firearms away from law abiding citizens here and arm up ISIS’ big brother. Brilliant! 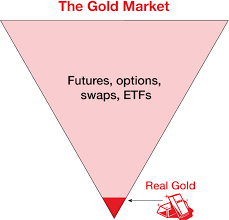 The Charade Continues – London Gold and Silver Markets set for even more paper trading. The London Metal Exchange and the World Gold Council announced the launch next year of a gold and silver paper trading platform, which will trade on the LME. The fine print reveals more of the same shenanigans and tomfoolery that occurs at Comex— i.e., multiple paper claims for each ounce of physical metal. See the graphic to the right. Got Physical? Yes, the excessive tomfoolery is getting to be so prevalent that it’s difficult for everyday working people to keep up. Hopefully, these weekly reports are useful to you in condensing the plethora of weekly news events and trends into an easily digestible format, thereby allowing you to stay well-informed without being inundated. I look forward to continually improving the content and format each week to serve you better. If you find yourself overwhelmed by all of this and are looking for a sensible place to start your “action plan,” I would point you to the “Five Levels of Financial Freedom”, an absolutely outstanding free resource. All of this week's 15 gold and silver charts/graphs are exclusively for FTMDaily members. Members, log in here to view the full article with all charts. Not a member? Learn more here. Above is a chart highlighting one of the many powerful trends being tracked at Follow the Money. Even with the broad stock market trading mostly sideways, there are still plenty of opportunities to profit from powerful trends like this. 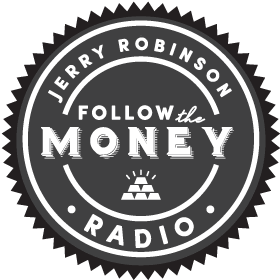 As a member of the FTM Pro Trader community myself, I can personally attest to the powerful combination of the Profit Trakker software and the twice weekly live (also recorded) conference calls with Jerry Robinson.